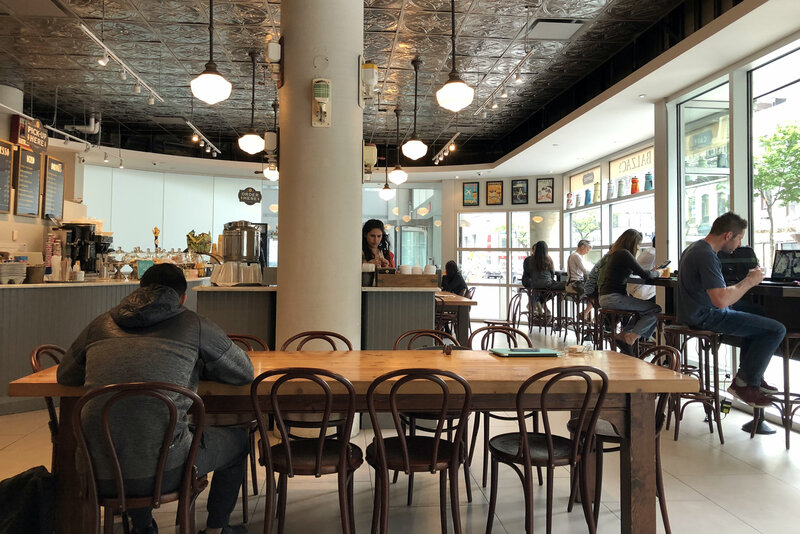 One of the real joys of being a writer is having the opportunity to work in coffee/tea shops in cities around the United States (and occasionally, abroad). It is a great thing when all the elements come together: ambience, music, WiFi, outlets, and beverage quality. It occurred to me that it would be nice to create and maintain a concise diary of places in which I’ve worked, in the hope that this will help guide some of my fellow caffeinated wordsmiths. As time permits (or when I’m procrastinating), I’ll back-fill details on some of my favorites. If anyone reading this has suggestions of other locations with good writing environments, please let me know. You can use the contact form to the right or send me a tweet. The shops are organized by location. Ctrl-F (or Cmd-F) is your friend. Description: A bright, spacious ground floor coffee shop on the campus of Ryerson University in central Toronto. Lots of windows looking out onto the corner of Bond and Gould Streets. WiFi: Free and fairly fast. Acknowledgment of terms and conditions. Seating: Plenty. Mixture of small tables, farm tables, and counters facing the numerous floor-to-ceiling windows. There are also a number of outside tables. Outlets: Very limited. There are a total of three or four outlets in the columns separating the windows. Ambience/Music: Moderately quiet. Fairly mellow music; Balzac’s has its own playlists that it streams to its various locations. Since the cafe is all tile and glass, sound does echo. 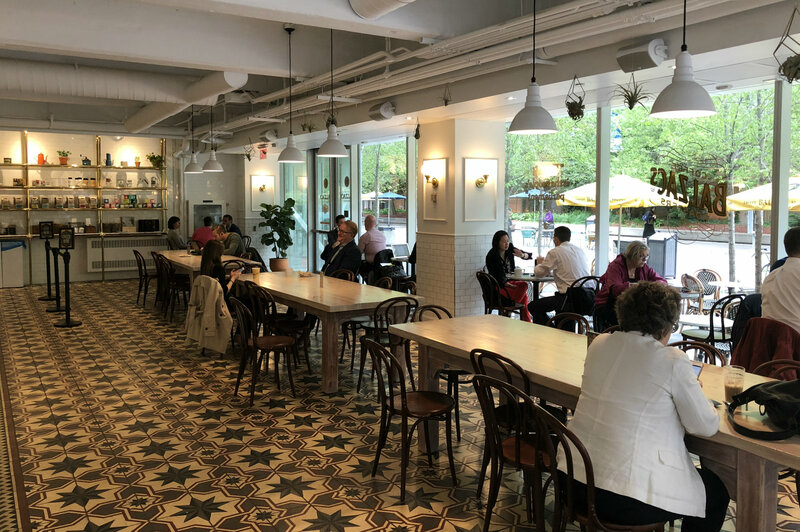 Description: A bright, spacious coffee shop at the base of the Toronto Reference Library on Yonge Street in north-central Toronto. When the library is open, the cafe opens directly onto the library lobby. WiFi: Free and fairly fast. No log-in or passcode required. Seating: Plenty. Mixture of small table, farm tables, and counters facing the numerous floor-to-ceiling windows. Outlets: The window counters have outlets installed underneath the counter. 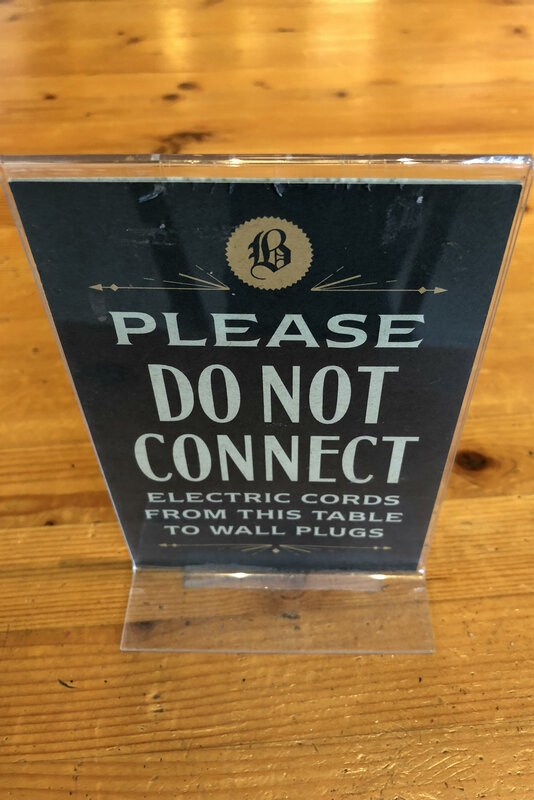 However, there are no outlets easily reachable from the farm tables or other small tables (hence the warning sign). Ambience/Music: Relatively quiet. Mellow music; mostly pop standards. Description: Another glass-enclosed coffee shop in the base of an multi-story building on upper Jarvis Street. The baristas work behind an island in the center of the shop. Tea: Loose-leaf tea in pre-filled sachets. WiFi: Free and fairly fast. Password is written on a small sign on the counter. Seating: Plenty. Counters line the windows; in one corner is a padded bench with small tables and a couple of easy chairs. The upstairs loft has another counter and some more tables and chairs. Outlets: Limited. There are a couple of outlets on the wall between the padded bench and window counter but those were the only ones I saw. I didn’t check out the upstairs loft.